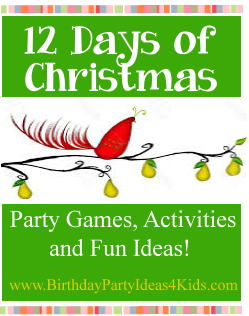 Twelve Days of Christmas Party ideas and games has just been added to the website! This is a fun party theme for birthday or holiday parties, boys, girls, kids, tweens, teens and adults! We’ve listed 12 fun party games all with twelve days of Christmas theme! The games are fun, easy and very inexpensive – most use items you already have around the house. There is also a 12 Days of Christmas Scavenger Hunt with instructions, directions, and a free list to print out. Get everyone in the holiday spirit with these great party ideas! Birthday Party Ideas 4 Kids – let’s get the party started!! !